Trail Websites and, our parent, Lewis Studios have designed and developed websites for multiple conservation trusts. Trail Data Manager™ was originally developed as part of a re-design for Littleton Conservation Trust. 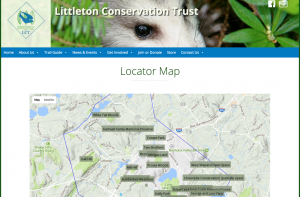 Littleton Conservation Trust (LCT) hadn’t updated their website in 7 years. The site had been built with a once popular html authoring tool and it was hard to modify since new content meant hand editing the html pages. Content about the properties that LCT administers in Littleton was duplicated in many places across the site, adding to the difficulty of updates since it was hard to find, and synchronize changes to the same content in the many places it appeared. Trail Data Manager™ was born to help solve this problem. We migrated the LCT site to WordPress to make content updates more like using a basic word processor without having to understand html. We built the trails database and management tools that would become Trail Data Manager™ so that the data about the properties and trails could be entered once into the database and displayed several ways on the site: an overview grid, detailed pages about each trail or property, a continuously scrollable “trail guide” and a downloadable, printable PDF trail guide. Anytime content about a trail or property needs an update, it can be done once in the database and all these manifestations of the content are instantly up-to-date.